Here is my entry for this weeks challenge from 'Just Us Girls'. For their challenges they don't have any restrictions. So, here is my submission. The template is from Paper Trey Ink. I printed the template onto Riding Hood Red card stock from Stampin' Up!. The pattern paper is from eskimo kisses. I used a long piece of scrap red ribbon I had (I didn't keep it on a spool, so I can only guess that it is from a large craft store.) The button is from Paper Trey Ink. I used the silver cord from Stampin' Up! to tie the button to the ribbon. 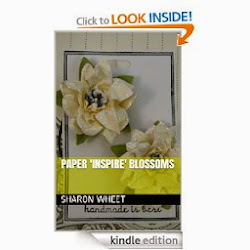 I had a small piece of shimmer white card stock (Stampin' Up!) so that is what I used to make my 'tag'. I stamped the tree in Old Olive and the greeting in Basic Brown. 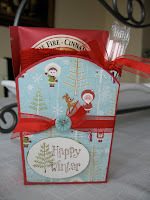 Both stamps came from the Happy Winter stamp set (Stampin' Up!). The contents of my gift bag, are a few of those chocolate covered peppermint sticks, a 'Fire-Cinnamon Vanilla' tea bag, and a StarBucks gift card in last years envelope. 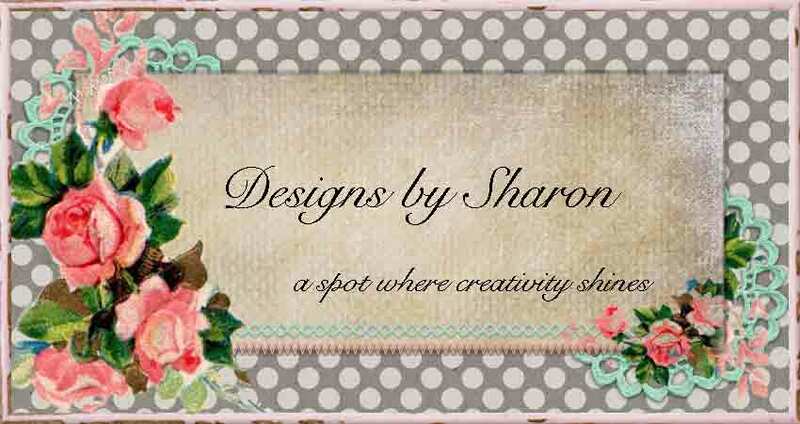 Sharon, this is an adorable lil' gift box/bag! Love the treats inside too :) Your big red bow looks fabulous! Thank you for playing along with the Just Us Girls template challenge! I hope you return Saturday for another fun challenge! Ooooh la la la - just adorable - love the colors! Great gift set. Thanks so much for playing along with Just Us Girls.